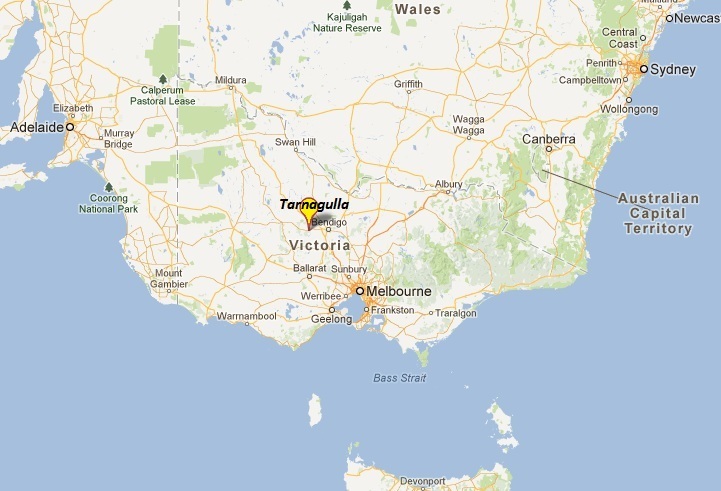 Tarnagulla is a small rural town situated in the heart of the Golden Triangle, central Victoria, Australia. It is a town founded on the excitement and hope of the Victorian Gold rush and quickly developed into a thriving community. Many large company gold mines employed scores of miners at their peak and many large gold nuggets were found. It was a town of enormous wealth for some. Over the years as gold became less plentiful many turned to farming and other pursuits. With a colorful history, Tarnagulla today is a quiet town with a population of only a few hundred. The following pages provide an insight into some of the history of Tarnagulla through photos, historic records, stories, articles from local papers and more. There are always new articles and records to be included and we are working towards getting as many of these online as possible. It is our hope that anybody with articles or photos of interest would also submit them for inclusion. In this way it is our aim to make this site a living resource for those of us interested in the township of Tarnagulla and to preserve our history for future generations. 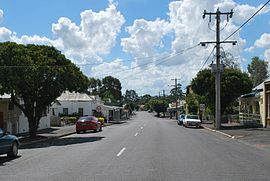 Tarnagulla today still has the charm and character of a town with a rich history and is well worth a visit. 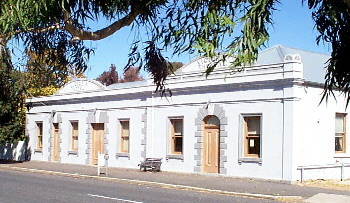 Many of the towns historic buildings still remain, as do remains of many of the mining sites - which will reward the visitor who takes the time to stop and have a look around. Township maps can be downloaded here and a walking tour found here. 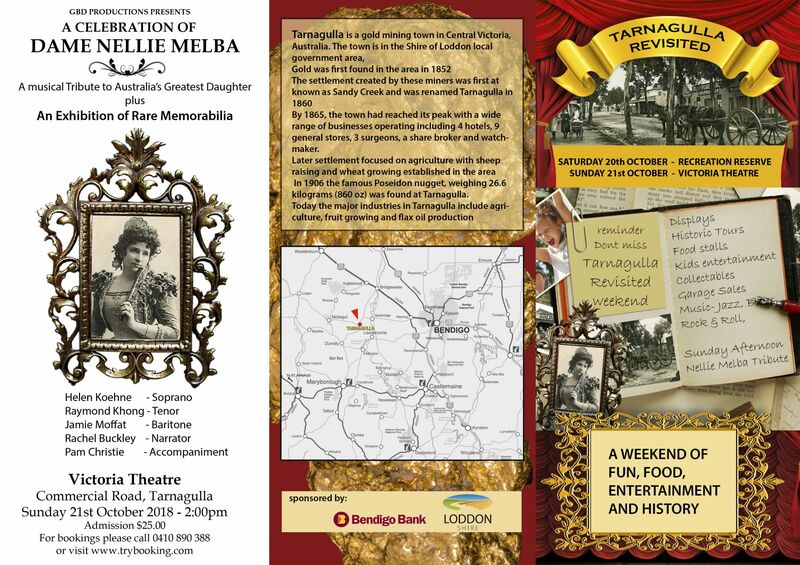 The annual "Tarnagulla Revisited" Fair for this year is scheduled for Saturday and Sunday 20 & 21 October 2018. A poster for the Fair is attached below and you can see that we're in for an entertaining and fun weekend. 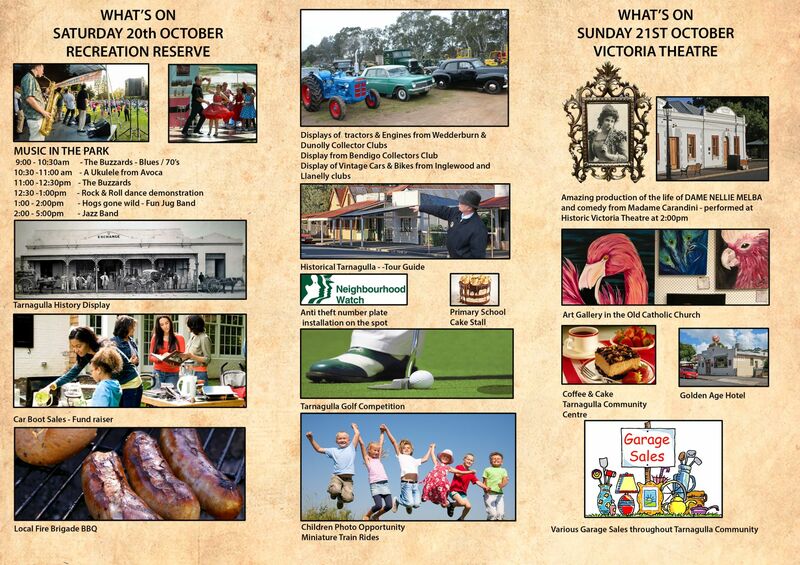 The fully detailed brochure also provides you with everything you need to know about all the activities, but you should note that much of the action this year will be at the Tarnagulla Recreation Reserve (or reservoir sports ground) on the Saturday. That's where we will also be located with the history display, which will be a little condensed this year but will be very appropriately situated in the wonderful and historic old pavilion building. The major attraction on the Sunday will be at the Victoria Theatre where Rachel Buckley is going to once again light up the stage with another of her very popular and professional productions, this time focusing on Dame Nellie Melba! By now you should have the weekend firmly marked in your diaries! The full size programme can be downloaded here (front) and here (inside). More information about this and past events can be found on our 'Upcoming Events' page. We are pleased to announce that the fourth and final book in David Gordon's wonderful Tarnagulla's Golden History series is now available. Book four is much larger than the earlier books at 237 pages, and embraces the period from 1891 until 1920. It's subtitled Fluctuating Fortunes and a Time of Transition. Within the book, there are many photos and other images of people and places taken during this very important period of Tarnagulla's history. The index is extensive, so there's a good chance you'll find references to your family among the 60,000-plus words. The period from 1891 to 1920 is perhaps the most dynamic in Tarnagulla's history. During this time, British mining investors finally became very interested in deep mining at Tarnagulla, and this was followed by a sensational series of shallow gold-rushes which broke out on a huge scale and took the district by storm. Not long after, the Great War of 1914-1918 and its aftermath would deal a blow to Tarnagulla. All these events and many more are featured and brought into context in the book. David's managed to keep the cost down to $29, which is a bargain-basement price for what truly is a high-quality and well produced publication. (Postage is available for an additional $10). If you would like to purchase a copy then you can either email David directly or contact us at the web site to get in touch with him. Within the Tarnagulla.com web site we have a large amount of material available as outlined below. This can be accessed via the main menu at the top of each page as well as via the following links. Details of the upcoming 'Tarnagulla Revisited - 2018' event. Details of the 'Tarnagulla Strictly Vintage Fair - 2016' which is to be held over the weekend of 1st & 2nd October 2016. A large number of photos have been added to the photo gallery. Be sure to have a look! David Gordon's third book in his "Tarnagulla's Golden History" series. This third book is titled 'Progress, Development and the Big Miners - 1869 to 1890' and is a wonderful publication. Details of the fourth annual 'Out N About in Tarnagulla - 2015' which was held over the weekend of 3rd and 4th October 2015. Details of the third annual 'Out N About in Tarnagulla' 2014 event. 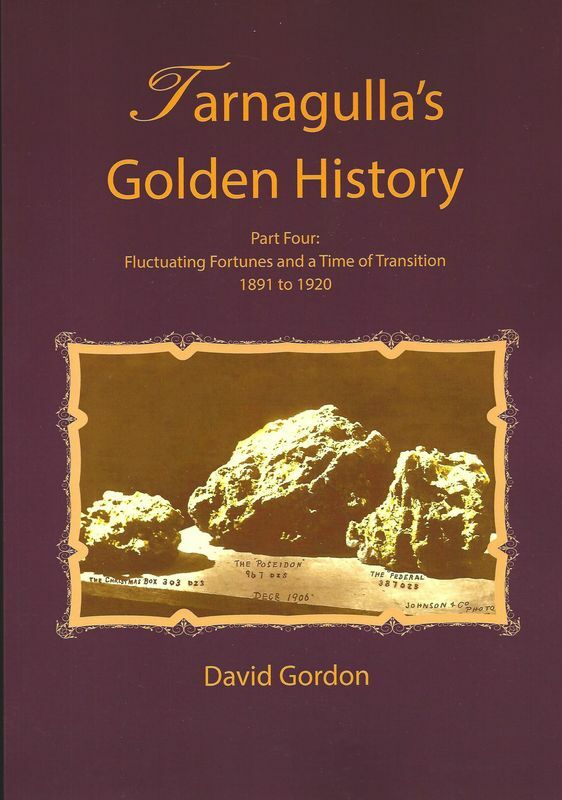 David Gordon's second book in his "Tarnagulla's Golden History" series. This second book is titled 'The Boom Years - 1858 to 1868' and is a wonderful publication. The Radnell reunion and Waanyarra Reunion - March 2014. Tarnagulla Primary School senior students completed a local history project. Find out more here! Our second Out 'N About in Tarnagulla was held on Sunday 6th October 2013 and was a great day! The complete 'David Gordon Index' has been added. This is a comprehensive index of the Tarnagulla Courier between 1869-1920. The Photo Gallery is constantly being added to and always worth a look! The Tarnagulla and Waanyarra Cemeteries CD is available. 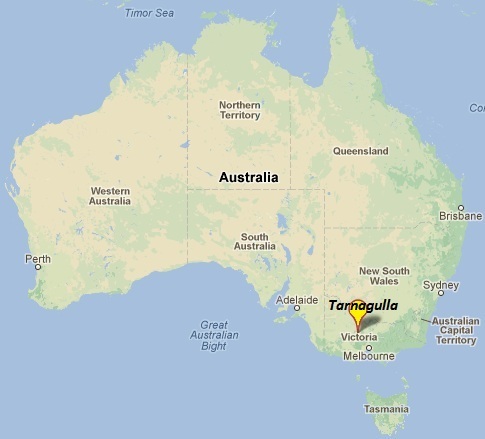 The 'Ironbark Gully Heritage Asociation Inc.' has just been formed. A full list of additions to the web site can be found here. page hits since this original site was created on 30th March, 2000.